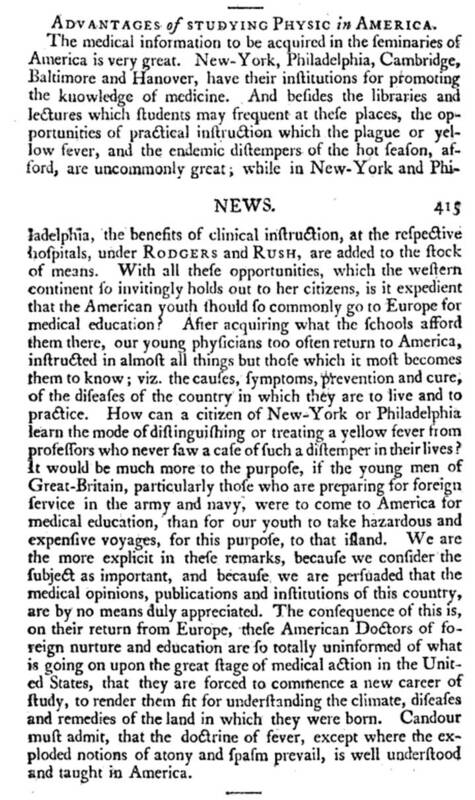 This section reviews the earliest medical geography articles that were uncovered during my 25+ years of research of Hudson Valley Medical history. I began this work in the summer of 1981, a result of my first review of the Yearbook of the Dutchess County Historical Society. During my first months of some research I was engaging in upon the physician who resided close to where my childhood home was located (I was actually living on what was his property during the 1740s to 1770s), I realized that I had some important insights into how he was interpreting the nearby marshlands, the source of whatever miasma he was treating. His choice of plants, his focus on the local Native American and “folklorish” recipes, his citation of some very famous physicians, made me realize that any research I did on the physician, Dr. Cornelius Osborn, was going to be a one of a kind opportunity. Over the next decade, I uncovered so many details about Hudson Valley history from books and journals for the time, that I was surprised to learn that few scholars spent much time trying to understand the philosophy of early Hudson Valley. As the years passed, I developed a much richer background researching all the related regular and “irregular” medical topics pertaining to Hudson Valley history, and then felt the need to determine why and how the Hudson Valley became the heart of American and United States medicine, not European medicine being practiced in the urban settings, but the first examples of American-born medical beliefs and practices for which little time has been spent researching within the academic setting. Researching Hudson Valley medicine for the pre-colonial, colonial and early post-colonial years up to 1850 provides us with the some of most accurate insights into early American culture that cannot be revealed anywhere else in the American medical history documents and writings. The only problem is, researching such a topic for which official documents appear to be scarce, and at times totally lacking, requires a different understanding of how doctors thought during these periods in American or United States medical history. Learning what the doctor felt meant we had to learn about local cultural and individual health-related philosophies. For the originally Dutch-owned and operated Hudson Valley, this meant that each and every culture that came to this part of the New World had to be researched and their physicians’ philosophies better understood. Fortunately, the sources for this information became available only during the past 10 years of internet history. which Indian traditions first made their way into regular medicine and alternative medicine by way of the Dutch related local multiculturalism (Dr. Cadwallader Colden, 1737, and and Dr. “Prince Quack Manessah”, the first “Indian Doctor” of ca. 1790)? why was Dr. Osborn prescribing ens veneris (essence of Venus), and where or whom did he learn this old alchemical recipe from? why was the first practicing Jewish physician (Isaac Marks) for North America residing in this region as early as 1739? why did the Fowlers so successfully produce and promote so many alternative forms of medicine and human health traditions in Wappingers Falls NY? why was Dutchess to place where medical electricity became a popular theory (Quaker doctors Jedediah Tallman and Caleb Child), due to the belief in vital force, a philosophy pondered upon but never fully believed in by New York city doctors between 1795 and 1805? why was the first Quaker doctor (Shadrach Ricketson) who published a book on natural healing methods in 1806 of local Hudson Valley history, and not Bostonian, Philadelphian or even Manhattan descent? why was Poughkeepsie the heart of the Thomsonian movement by 1825/1830 (Thomas Lapham)? how and why did homeopathy first become a major form of medicine promoted by Poughkeepsie doctors? This section provides examples of articles detailing how physicians and believers in the medical geography theory based interpretation of health viewed their local topographic and climatic settings. This interpretation of ‘Place and Health’ first became popular during the Post-War years, reaching its first peak between 1805 and 1810, and continuing until the mid-19th century. Most of the local doctors had an interpretation of disease in relation to local topograpjhy and climate due to the writings of Lancisi. Lancisi was in fact the primary influence that led Samuel Mitchell to produce his interpretations of the local environment in terms of health, for which reason Mitchell republished Lancisi’s works in the Medical Repository, a local medical journal he was chief editor for. But other signs of medical geography thinking and familiarity with Lancisi’s work are seen as well for Cadwallader Colden, ca. 1720, and Dr. Cornelius Osborn, ca. 1735-1755. Osborn’s reaction to this theory is more symbolic in nature however, and is best symbolized by where he had his house and barn built. He resided on the warmer south face of a large hill, well above the miasma-ridden swamp just east of and downwind from his property. Across the river, David Arnell became an important influence in Orange County, a large tract of land riddled with wetlands, bogs, marshes, lakes and the like, and prime terrritory for vast numbers of fevers to evolve and develop as local diseases for the region. When Cadwallader Colden settled in this land around 1730, he noted the value of the land for its resources but was always cautious about what the next disease to strike this region would be. The relationships of this part of the Valley to the Island of Manahattan and its neighbors and residents were important to how medicine evolved into a unique form of Hudson Valley medicine. According to Mitchell, the medicine of each region is unique, as are the region’s diseases and medicines. So it was important to learn medicine within your local environment, and to better understand the wants and needs of your homeland areas in terms of health and medicine, you had to study you local topography. Thus the reason for these articles common to the local medical journals.